It is your responsibility to keep a personal record of the immunizations (vaccines) you have had in your lifetime. Keep it in a safe place with your other personal medical information. Bring it with you each time you are immunized so it can be updated. If you do not already have a card or booklet to keep track of your immunizations, ask your doctor, nurse or local public health office if they provide these. You can also download the CANImmunize app to track your immunizations on your mobile device or computer, or print this paper record: Adult Immunization: What Vaccines Do You Need? It is your responsibility to keep a record of the vaccines you have received. Check with your doctor, who may have a record in your file. Check with the local public health office where you were immunized as a child. Most public health offices maintain a registry of childhood immunizations in their area. Check with your employer. Some employers keep proof of immunization (e.g. military). 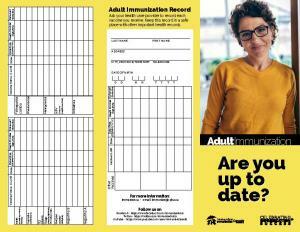 Information about your province or territory's adult vaccine schedule can be found here. Your record will probably have abbreviations of the vaccines you received. An explanation of the abbreviations can be found in the Canadian Immunization Guide .